A bit of a change from the usual books I read, as I usually pretty much exclusively tend toward cookbooks, crafting books, and mind-candy fiction, but we have a major clutter problem in our house, and I was hoping for inspiration as to how to get rid of it. It arrived and I read all the way through it…. and I just don’t know quite what to make of it. It is clear that she is a tidying up enthusiast, and enthusiast is slightly underestimating it a bit….. The author’s life has been dedicated and possibly obsessed with tidying since the age of 5, first her own things… then sneakily tidying up and discarding items that belonged to her siblings and parents. 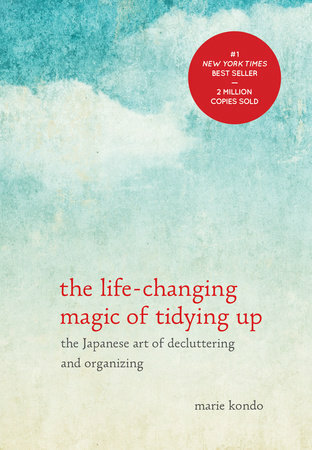 The book describes a fairly fixed set of rules and guidelines to how to tackle a big tidy up, using the KonMari method, to achieve tidying perfection in your house. At it’s simplest, it asks “does this spark joy?”, and those items that do not are discarded. This all basically an extension of common sense, but rather than having fixed rules like, if you haven’t worn it in one year, or one-in one-out, it relies on feelings towards items. Once your possessions are pared down to a minimum… well, that is much easier to keep tidy. The next stage, that of tidying and keeping tidy, is where I started to have issues. I believe that people work in different ways, live in different ways, and use things in different ways, but the rules of the KonMari method are quite rigid in the absolute best way to store everything, fold your clothes, and live in your home. I am just not sure that this is how we are able to live. For example, my husband has a large collection of limited edition Lego, I have a large collection of crafting stuff. Generally the joy comes from using the items, not from merely touching them. …and the strict instructions to empty our their bag once they return home and put everything in it’s proper place, put away their outside clothes and change into their inside clothes. This is kind of like a more extreme version of the nagging I get daily to hang up my keys when I get home. I generally use only one bag, so having the things I need, such as ID badge, purse, sunglasses etc. already in there means I just need to pick it up and then be ready to go, rather than taking them out and putting them back in again every day, which seems like such a waste of time. Am I going to embrace the KonMari method? Nope, but I will have a purge and tidy, and undoubtedly some of the tips and suggestions detailed in the book will come in handy, I am just not ready to surrender my life and home to such constant perfection. Do we need perfection? Will we ever be ready? Is this item really needed? Do I have a place to store this when I get it home? How much extra work will this possession add to my life? Am I buying it for the right reasons? I too am a collector, which leads to clutter and I was going to purchase this book, another to add to my collection? Do I need another book or just take on board that I need to declutter? Hence the book title caught my eye. So I looked on line and found this? Could you review this book, or the article, and compare? Maybe we need to start. I liked the four steps.